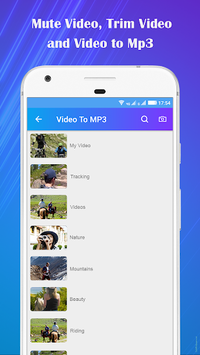 Convert any Video file to Audio file in MP3 format with Video to MP3 converter. Remove Audio from Video(Create Mute Video). Trim Video of any format, size & duration with same quality Output. Mix Audio with Video and Add Audio to Video. 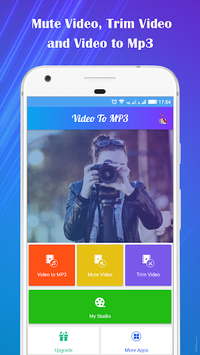 * Video to Mp3 converter - Extract Audio from Video of any format and save as Mp3 file in your device. It is the easiest-to-use mp3 converter and video converter. Easily convert video to mp3. * Mute Video - Wanna remove audio from Video? Use this app to Mute Video , voice mute and remove unwanted Audio from your Video. Create best quality mute videos. * Trim Video - Easily select the part of Video you wanna trim and get same quality output Trimmed Video using this video trimmer. Use this easy to use video cutter. 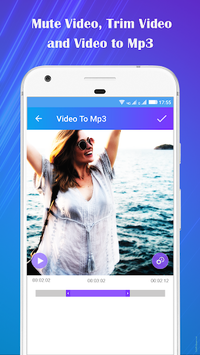 * Add Audio To Video - Best Audio Video Mixer to change video background music. Change video sound . * Mixing - Add music to video easily and do audio video mixing with this video music adder . * Fast Processing. Mute and Trim video in approx. no time. Fast Video to Mp3 Conversion. *Easy to use with Intractive UI. We welcome feedback so if you have any suggestions or problems with the app, contact us at : [email protected] We always try to upgrade to give you the best experience. 3. Added accurate video trim. 4. Added mute without trim video(only selected part video will be mute). 5. Added mute with trim video. 6. Added meta data change.